Former national security adviser Michael Flynn sitting in the White House in February. The Senate Intelligence Committee announced it has subpoenaed two companies owned by Flynn. 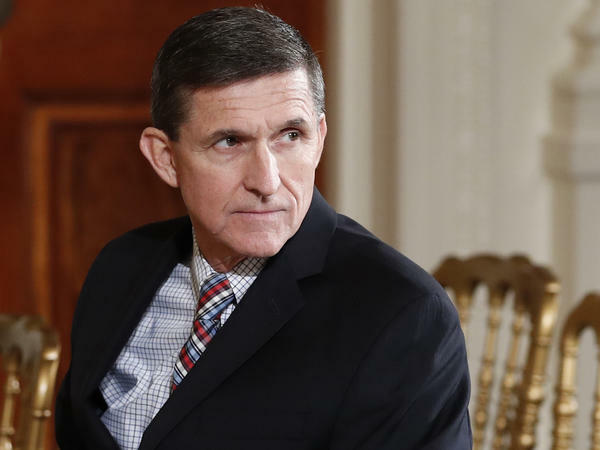 As the Two-Way reported, Flynn has invoked the 5th Amendment and has refused to turn over any documents subpoenaed by the committee related to his interactions with Russian officials during the 2016 presidential campaign. "While we disagree with Gen. Flynn's lawyers' interpretations of the taking the Fifth, it is even more clear that a business does not have a right to take a Fifth if it's a corporation," said Warner. One subpoena has been served and another is in the process of being served, he added. Yesterday Flynn's lawyers said that the committee's subpoena was overly broad and that complying with them would "feed the escalating public frenzy against him." But Burr disagreed and said the committee has sent a letter to Flynn's lawyers questioning the legal basis for his refusal to cooperate with the request for documents.